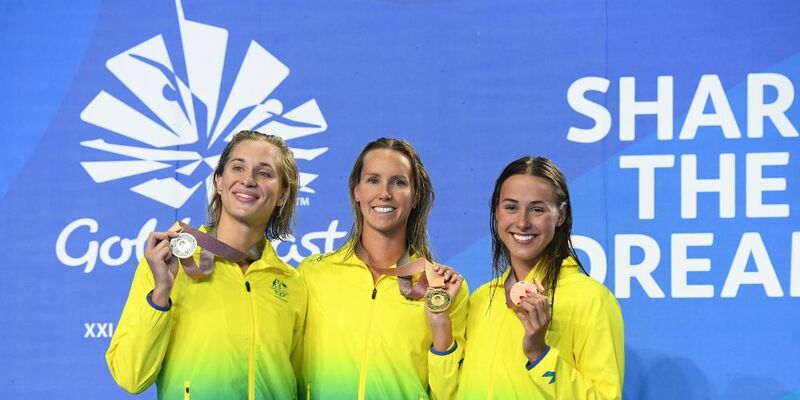 WA athletes were back in action on day two of the Commonwealth Games, with Brianna Throssell earning a bronze and our netballers scoring a big win. City Beach local Brianna Throssell put in an incredible effort from lane one to earn bronze in the final of the 100 metre butterfly final. Throssell finished behind Australians Madeline Groves and Emma McKeon, who set a Games record time of 56.78 in the final to take home gold. It was a great result for the 22-year-old, who capitalised on solid form in the lead up to the competition. Perth-born, Canberra-based athlete Madeleine Scott finished fourth in the women’s S9 100m backstroke final last night. Scott finished just behind Australians Ellie Cole (silver) and Ashleigh McConnell (bronze). Alice Tai of England claimed gold with plenty in the tank. Tai was a second behind her world record time. Sam Welsford – track cycling. Track cycling is a gruelling sport and local Sam Welsford knows that more than most after missing out on a shot at a men’s 4000m individual pursuit medal by .06 of a second. The Woodlands local finished fifth in qualifying, with the gold going to England’s Charlie Tanfield. Caitlin Bassett and Courtney Bruce – netball. In the netball, Australia blitzed Barbados 79 – 24 in their Pool A game at the Gold Coast Convention and Exhibition Centre. West Australian Caitlin Bassett scored 23 of 26 shots to get her Games as skipper off to a solid start. The Australian side, which also includes West Coast Fever defender Courtney Bruce, next plays South Africa on Sunday.